I'm been working all week on the Chanukah feature I told you about and as part of the decor I am using beautiful decorative paper dreidels made out of scrapbook paper heaped in a basket. Actually, Chanukah is only five weeks away so it's really not too early to start a project like this! 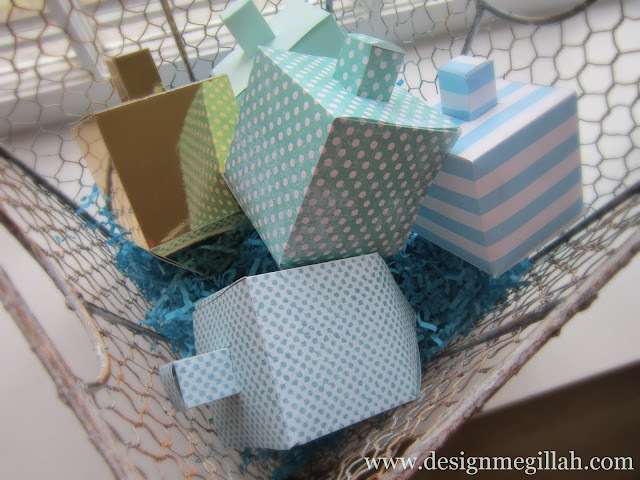 I've been making these paper dreidels for years--what I love about them is how versatile they are. 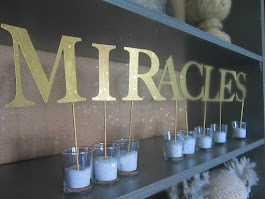 I've hung them from doorways, strung them in a garland from my mantel and used them as favor boxes at Chanukah dinners. 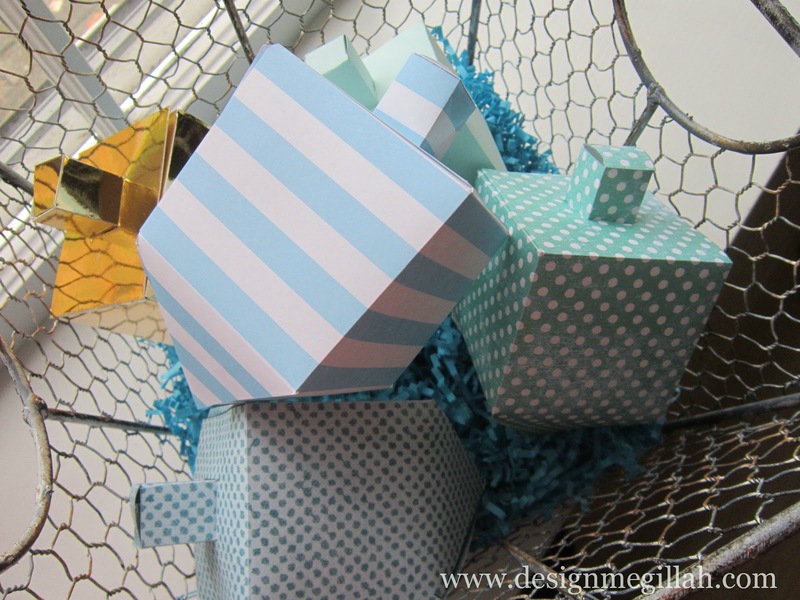 I did not add the hebrew letters to these since they are only decorative and I wanted to emphasize the pretty papers. 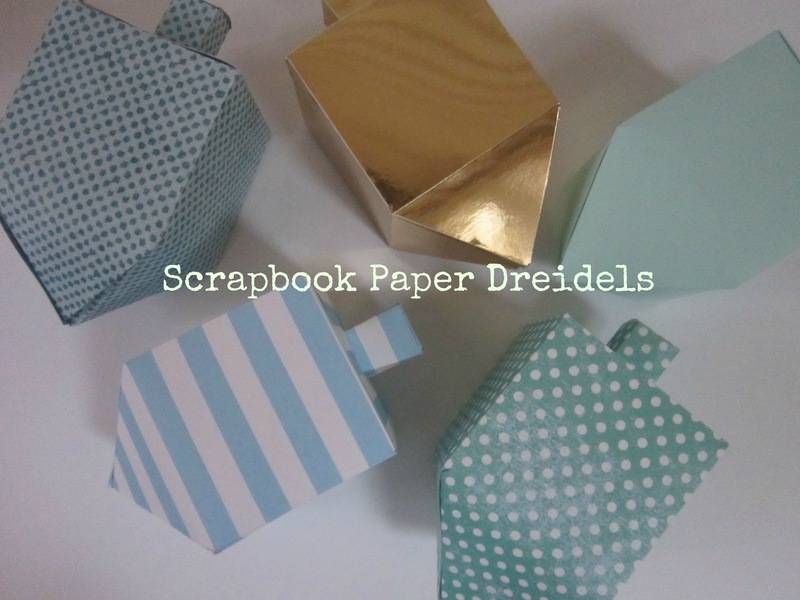 Here is a template if you'd like to make paper dreidels for your Chanukah celebration. So pretty! I definitely want to make this for the family chanukah party this year! Thanks for sharing. Love everything you've been doing. Thanks for making Chanukah tasteful and not tacky. Everyone thinks I'm crazy because I have a color scheme for Chanukah. Your blog is fantastic! I've had such a hard time finding decent Jewish Blogs and am thrilled I finally found you. 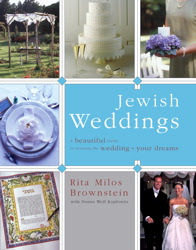 Have requested your design books for Chanukah. Hopefully my husband will follow through, otherwise I will definitely be using my own gelt to purchase them. Julie W.
OMG...you totally made my day (and week)! Thank you! oh my god, 5 weeks! are you serious! 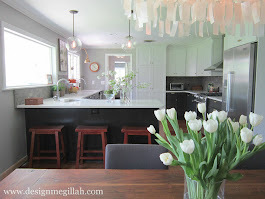 these are so pretty, i will definitely have to see about making them. November seemed to fly by and so will December! I think it's a great idea to make dreidels using scrap book paper. Chanukkah is the symbol of dedication and peace. 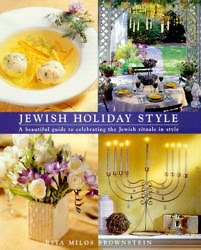 Jews enjoy this festival with fun and happiness. It is one of the most exciting children's game. I wish I knew about you 2 years ago when we had my daughter's Bat Mitzvah! I found you via Bonbon Break, by the way!